Are you frustrated with wireless microphone problems? Does it seem like your microphones aren’t giving you the great sound they should? Have no fear, Brian and Chris are here! Together, they cover common wireless and wired microphone problems…and solutions. 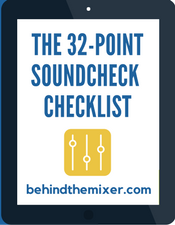 They also discuss the four major microphone properties every sound guy should know to guarantee they are using the right microphone for the job. 003 – The Latest on the FCC’s 600MHz Auction. Although having a mic frequency response tailored to the input tonality, particularly vocals, has benefits, standardising on a mic for say backing vocals (with different vocalist week to week) gives the opportunity to get to know the frequency response of the mic and you quickly learn which frequencies are best to cut/boost for each vocalist. Also if feed back control is an issue it’s the same EQ adjustment for each mic! Comfort of holding a mic – personally I liked the AKG Tri-power range, comfortable to hold (& didn’t roll around!) and had a nice balanced weight. Having added to our mic stock with AKG D5’s, these are somewhat head heavy and for long worship sessions could take a bit more effort in maintaining a good mic technique.